Coop.dk MAD (formerly known as Irma.dk) has been awarded the title as best online supermarket in the country and the goal is to keep this position while also stooping for an 80 percent growth. This can only be done, if the foundation of warehouse and logistics runs optimally, says Irma.dk's commercial director. In the cool warehouse in Vallensbæk, you will find exactly the same products as in any Coop store, but the presentation is undeniably another. Here it’s not about making the organic carrots and milk interesting for the shoppers. Instead, the products need to be placed most appropriately for the pickers driving along carefully planned routes and bringing products to the customers, who’ve placed an order with Coop.dk MAD. The pickers are busy, since Coops online super market is seeing an immense growth. ”We have had an 80 percent growth in 2014 and it is our goal to achieve as high growth rates every year for the next three years,” says Jesper Wacherhausen, commercial director at Coop.dk MAD. Coop.dk MAD is Coop’s large venture in the industry of e-Commerce with Fast Moving Consumer Goods and the large growth has been possible since the company has optimized the concept for their online supermarket significantly over the last couple of years. Both when it comes to the distribution of the goods, that has been outsourced to Post Danmark, and also the structure of the warehouse itself. Coop.dk MAD (formerly Irma.dk) was in 2014 awarded the title as the best and cheapest online supermarket in Denmark, as part of a substantial test in the newspaper, BT. According to Jesper Wacherhausen, a well functioning warehouse is the basic foundation for an online supermarket. 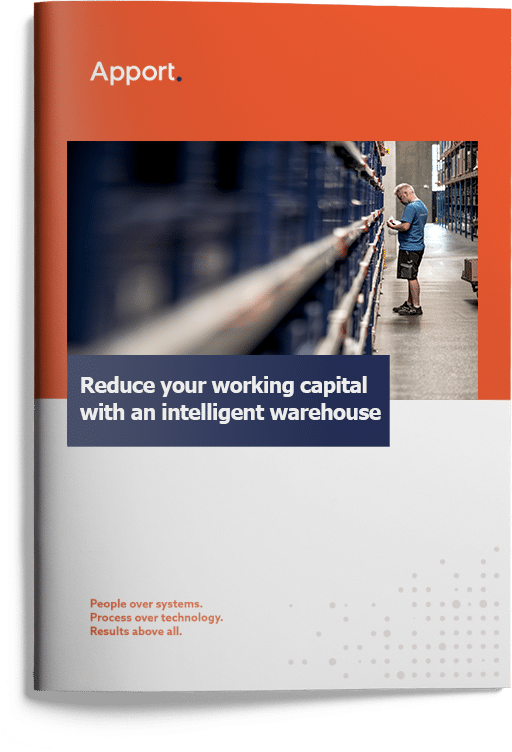 Coop.dk MAD base their warehouse management on Apport WMS. ”Our warehouse management has a lot to say when it comes to succeeding with everything else. If we don’t have the products on the shelves, so that we can pack them properly and deliver them in time, everything else falls appart. For us it is about putting the customer in the center, and if we are to do this alongside seeing a substantial growth, it demands a lot from our production machinery,” he says. ”We had, for instance, a challenge with our peak load periods, where the pickers in our previous setup could not work efficiently enough. “As we have seen so much growth, we have need a lot of continuing development of our work procedures. Vi get smarter along the way and it has been important to us that Apport has helped making us smarter and contributed to developing our concept,” she says. As Head of Terminals, Judith Juhl Silberg is in charge of the operations with picking/packing, distribution and customer service. She continually looks ti improve the warehouse, a job she solves in close cooperation with Apport. ”It’s the details that make the difference. We are always looking for ways to save time and become more efficient. This might be the way orders are released or the consolidation of routes. Whenever we see a process that might be done more efficiently and smart, we get in touch with Apport, in order to convert the idea to a specific efficiency improvement,” she says. According to Judith Juhl Silberg, the wishes and wants from Coop.dk MAD to Apport has been steadily rising. ”We starting asking for more and more things, that aren’t standard solutions, as our demands increase. As our pickers get better, they start demanding more and more of the system, and Apport have been quick to meet these demands. The will to solve our challenges along with us, is something we have been very pleased with. We have a lot on our plate at the moment and it takes a lot of flexibility to work with us,” she says. The warehouse in Vallensbæk is 6000 m2. The are more than 5.000 different item numbers on the shelves. Their assortment has all types of staple goods, such as fresh goods, refrigerated goods and frozen goods.